<편집자 註: 아래 사설은 미국 LA Times 2008년 6월 19일자 사설 전문과 번역본입니다. 이번 미국 쇠고기 수입 파동 및 추가협상 논란과 관련하여 참고할 사항이 될 수 있겠다는 판단에서 올리는 것입니다. 이 사설은 일본과 한국(원문에서는 남한)의 고객들이 더 철저한 검사를 요구하고 있다고 밝히고 있는데, 한국의 경우는 정부가 미국의 기준과 자체 검사를 “신뢰”한다고 합의하고 추가협의한 상황입니다. 광우병을 검사하는 테스트가 쓸모없을 때는 언제일까? 미국 농무성에 따르면, 민간기업이 그 테스트를 할 때라고 한다. 적어도 이는 미농무성이 개별 육류생산자가 자체 소도축물에 대한 검사를 행하는 걸 막고있는 근거이다. 연방기관은 현재 고위험도 축우에 대해서 속성 심사에만 의존하고 있으면서도 크릭스톤 팜즈라는 육류생산자가 하려는 전수검사를 “무용지물”이라고 지칭하고 있는 것이다. 소비자들, 특히 일본과 남한같은 외국 소비자들이 미농무성의 랜덤 검사 프로그램에 대해 우려하고 있다는 걸 잘 아는 캔사스의 식육회사는 자신들이 보유한 최고 수준의 검사실을 사용할 수 있는 권리를 확보하기 위해 미농무성과 4 년째 투쟁 중에 있다. 현재 미농무성은 100% 정확성이 담보되기 어려운 속성검사를 채용하고 있기에, 크릭스톤은 여전히 자체 도축물에 대해 광우병(기술용어로 bovine spongiform encephalopathy)으로부터 안전하다는 보증을 하지 못하고 있는 것이다. 허나 이 업체의 고객들은 별도의 추가 검사가 가치있는지 아닌지에 대해 결정할 권리를 가지고 있다 할 것이다. 미농무성은 민간의 검사는 불필요하며 그들의 자체 프로그램, 즉 1% 미만의 소에 대해 행해지는 검사가 대중들을 광우병으로부터 적절히 보호할 수 있다고 주장한다. 맞는 말일 수도 있다. 현재까지 미국 쇠고기가 인간변종질병의 원인이 되었다고 알려진 사례가 없기 때문이다. 그런데 어느 선도적인 기업이 동물이나 인간의 건강에 害가 되지 않는 검사를 시행하여 고객들이 원하는 바를 제공하겠다는 것을 왜 못하게 하는가? 미농무성은 크릭스톤의 방식에 반대하는 [미국]소고기 산업의 입장을 더 중시하는 듯 하다. 이러한 검사가 시행되면 다른 기업들도 동일한 검사를 하라고 소비자들의 압력이 거세질 것이기 때문이다. 크릭스톤은 첫 소송에서 승리했다. 그러나 미농무성은 항소를 하였고, 판결이 곧 나올 예정이다. 그러는 와중에 미합중국은 크릭스톤 같은 기업들이 사업을 확장하는 걸 거들지 않고, 대신 다른 나라들이 미국의 쇠고기 기준을 받아들이도록 설득하거나 강압하여 제한적인 성공만을 거두었다. 최근에 남한의 대통령 이명박과 맺은 거래는 엄청난 거리 항의로 이어졌다. 우리[미국]의 삥뜯기식 쇠고기 외교가 고객 대신 적개심만 벌어들이고 있는 사이에 호주는 시장 점유율을 증가시키고 있는 중이다. 미농무성은 최근 몇 년간 육류기업들이 농무성 안전기준을 충족토록 하는 것도 제대로 못하고 있다. 그들은 이 일부터 제대로 마무리 해야 할 것이며 개별 생산자가 고객들이 원하는, 농무성 기준보다 더 상향되고 우수한 안전 기준을 제공하려 하는 걸 방해해서는 안 될 것이다. The agency’s refusal to let firms test for the disease denies consumers a safety net. When is a worthwhile test for mad cow disease not worthwhile? According to the U.S. Department of Agriculture, it’s when a private company uses the test. At least, that’s part of the argument the USDA has been using to keep a beef producer from screening the carcasses of all its cattle, saying that although the federal agency relies on the rapid-screen test for high-risk cattle, the test would be “worthless” in the hands of Creekstone Farms. Knowing that customers, especially foreign ones such as Japan and South Korea, remain wary of the USDA’s spotty screening program, the Kansas meat company has been fighting the agency for four years for the right to use the state-of-the-art testing lab it built. The rapid-screen test is not completely accurate, but it has been useful enough for the USDA to employ. Creekstone still would not be able to legitimately label its products as free of bovine spongiform encephalopathy, the technical term for mad cow disease, but its customers should have the choice of deciding whether the extra screening is worth paying for. The USDA contends that private testing is unnecessary and that its own program, which tests fewer than 1% of cattle, adequately protects the public from mad cow. This might well be true. 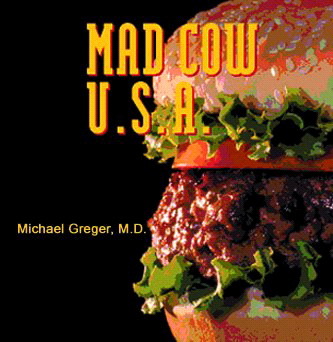 There is no known instance of U.S. beef causing a case of the human variant of the disease. But as long as the test presents no threat to animal or human health, why shouldn’t an innovative company give customers what they want? The USDA’s motivation probably has more to do with the beef industry’s opposition to Creekstone: Testing might put consumer pressure on other companies to do the same. Creekstone won its first battle in court, but the USDA appealed; a ruling is expected soon. Meanwhile, instead of letting farms like Creekstone grow their businesses, the United States has been trying to persuade or strong-arm foreign countries into accepting U.S. beef standards, with limited success. Its recent deal with South Korean President Lee Myung-bak led to massive street protests. And while our bullying beef diplomacy reaps enmity instead of customers, Australia is increasing its market share. The USDA has had enough problems in recent years making sure that companies meet its safety requirements. It ought to get that job done, and not interfere with producers that are going above and beyond to provide the safety standards some consumers want.